The advent calendar is available in two versions. The first version does not need anything else than the activation of macros. You can answer the questions by clicking on the buttons next to the questions, which appear in the ribbon tab “Advent calendar”. And you can select a question by clicking on the day numbers or by using the buttons “Next question” and “Previous question”. However, some of the buttons just only show a message box; for example is you try to choose an author. This is due to the fact, that’s not possible to change the ribbon tab at run time via VBA. 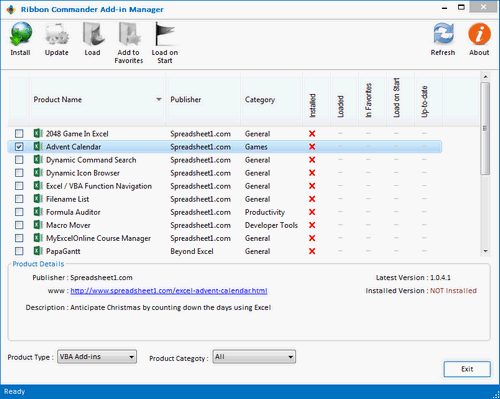 The second version of the advent calendar uses the Ribbon Commander Framework. This framework allows dynamic Ribbon UI development from VBA & .NET and therefore the second version of the advent calendar offers more possibilities. After downloading the framework (which can be freely tested for 30 days), you can download the advent calender from its integrated Add-In-Manager. The framework can be directly downloaded from the source site or you can use the web laucher, which is an Excel-Add-In and does all work for you via Excel.